Previous PostPXW-FS5 Screen Protector updated images.Next PostReplacement Mic Holder for the PXW-FS5 (and others). Alister, in the past you’ve preached avoiding overexposing S-log too much because of compression in skin tone highlights (i.e. only over expose a couple stops to reduce shadow noise). Where does that compression you warned us of come from since, as you say, there’s no highlight rolloff? 1: The light in a scene doubles every time you go up a stop, so each extra stop in the scene has double the range of the previous one. Meanwhile log records every stop above middle grey with the same amount of data. So RELATIVE TO THE SCENE as you go up and up log records with less and less data. (a standard gamma or hypergamma reduces the recording data down to zero at or just before the cameras clip point. Log continues to record the same amount of data, but the range in the scene is increasing). 2: In the past, before we had wonderful tools like LUT Calc, Colour Managed Workflows, ACES etc most grading involved applying a LUT designed for the cameras base exposure. The LUT would almost always introduce a highlight roll off that would start 1 or 2 stops above skin tones. So if you over exposed you would put skin tones into the highlight roll off of the LUT and things would not look good. We didn’t have linear workflows like ACES and as a result it was difficult to correctly deal with log that was exposed extra bright, it was difficult to make skin tones look good. Much has changed since then. We now have the proper tools to recover data in the correct manner from brightly exposed log. We have exposure compensated LUT’s that will re-expand the brightly exposed log back to levels and ranges similar to the scene. We have colour managed workflows that convert the log to linear, again restoring the the real world range for highlights so we can tweak and adjust them more easily. So many of the problems that used to occur from exposing too bright are no longer issues. But, the way log records hasn’t changed. So relative to the scene there is still less data in the brighter stops. 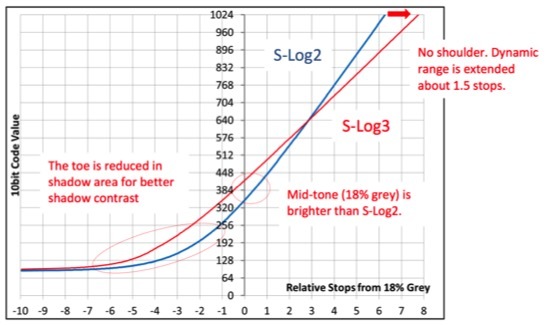 So you don’t want to expose too bright but at the same time a bit of extra light on the sensor will often improve the signal to noise ratio and give a cleaner image. So there is a balancing act between noise and highlight data. With an FS5 and FS7 I choose to shoot at around +1.5 stops. I might go to +2 for a scene with large shadow areas and limited highlights. + 3 is almost always too bright and often introduces problems with highlight recovery and possibly skin tones. How brightly you shoot varies from camera to camera. Sony’s Venice for example has very little noise so I don’t find I need to shoot bright with Venice. Thank you for the thorough response. The explanation that the aforementioned compression is a result of the LUT clears it all up for me. You’re very right about dealing with overexposure being much simpler nowadays. One of my favorite features of Resolve 15 has to be how easy it is to just right click a node and set it to operate linearly so a quick exposure offset can be made via gain. Too few people seem to realize how easy it is. Maybe I’ll make a video out of it. Thanks again Alister. Buying you another beverage.